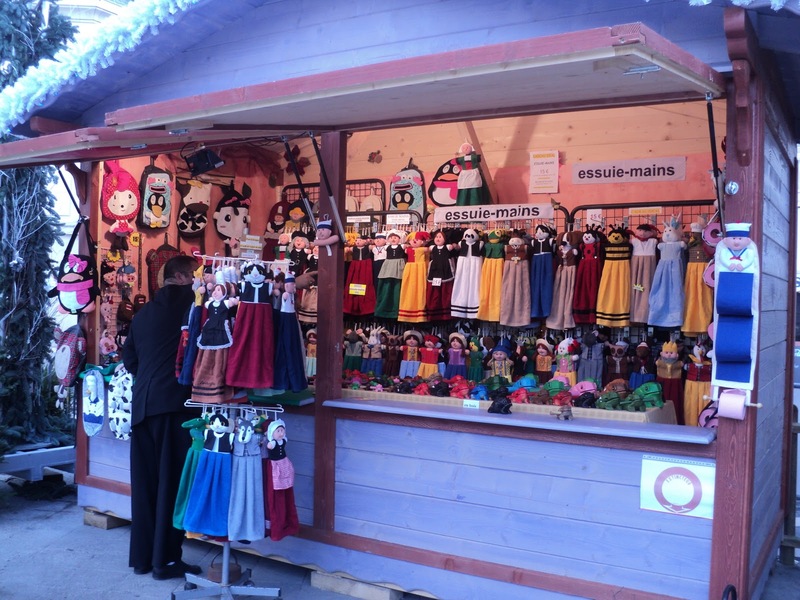 Bécassine is making her appearance here at the Orléans Marché de Noël, this time in the form of hand towels... She's the Breton star of a comic strip of the same name dating back to 1905. This young heroine is considered to be the first female leading character in a comic. 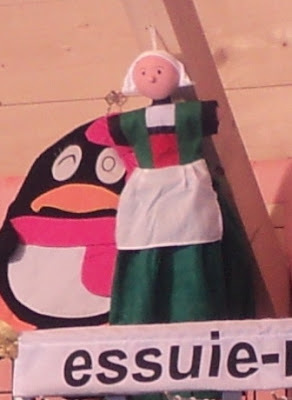 The young housemaid from Brittany (on the Atlantic coast) is usually depicted wearing the green dress above, with a high lace headpiece and clogs. She's supposedly from Finistère, the area considered to be the center of traditional Breton culture. The name Bécassine can be translated as silly goose. Her character initially was meant as a stereotype of French country people, but later she was depicted more favorably. The comic appeared in La Semaine de Suzette (Suzette's Weekly) and targeted young Parisian girls. I've never seen a picture of her with a mouth. She's been drawn by several artists over the years, and the clear line drawing style from these comics is said to be the inspiration for Hergé's The Adventures of Tintin. In the late 70's, after a decline in popularity, her character regained notoriety when Chantal Goya's hit single, "Bécassine, c'est ma cousine" ("Bécassine, she's my cousin") sold over three million copies. The song was followed up by a Breton guitarist's song, "Bécassine, ce n'est pas ma cousine" ("Bécassine, she's not my cousin"). In 2001, an animated feature film was released called Bécassine, Le Trésor Viking (Bécassine and the Viking Treasure) and in 2005 La Poste issued a stamp honoring her 100th year. Her image is seen all over France, but especially of course in Brittany (spelled Bretagne in French), my husband's region.